Canada’s superheroes must come together to save not just the Great White North but the entire world from an alien invasion! 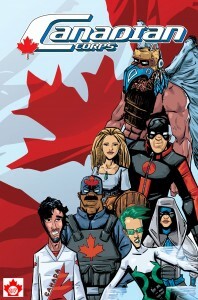 Canadian Corps is the story of the Canada-based superhero team set in Andrew Lorenz’s (September17 Productions) S17 Universe as they band together in an attempt to beat back an invasion and save the world from an army of alien conquerors. Coming from a variety of backgrounds, they must learn to work as a team and step up to truly become the heroes they are capable of being. WARRANT- Ottawa-based RCMP sergeant with the power to control gravity. SHIELDMAIDEN- Hard-working hockey mom who can turn into a powerful warrior woman, able to take on armies. IMPACT- Spotlight-loving teen who moved to Canada to play soccer and along the way gained the ability to absorb and emit kinetic energy. THUNDERHAWK- The winged warrior of Canada’s First Nations people. He seeks to use his powers not only to defend his people but to inspire them as well. KID MERCURY- Calgary-based speedster who gained her powers in the same incident as Impact. A pop culture and science geek, she loves being a superhero. FLUX- A former science teacher of East Indian ethnicity, he now works in a garage as his degree was not recognized in Canada. Undeterred, he continues to use his knowledge and his ability to bend time and space for good. His love of science is only rivaled by his love of hockey. AZURE- The latest guardian of her family’s magic bracers, Azure seeks to balance her university schooling with her obligations as Chinatown’s costumed champion in Vancouver.